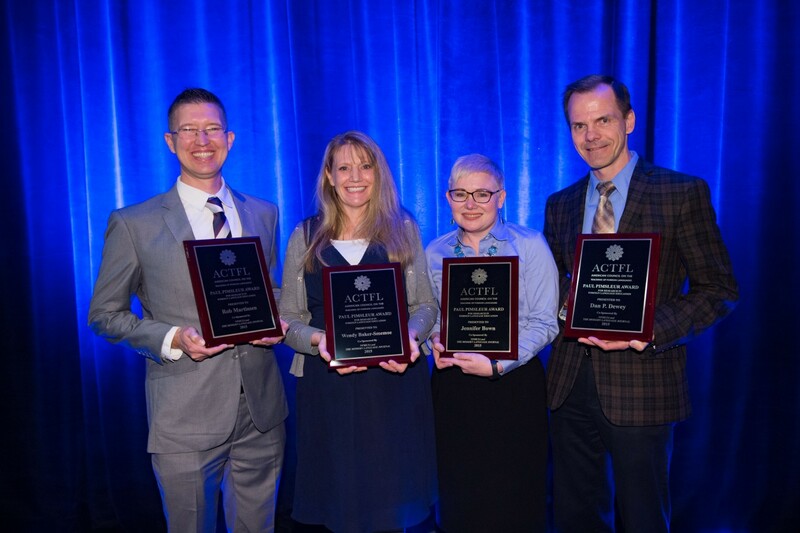 Professors Wendy Baker-Smemoe, Dan Dewey, Jennifer Bown and Rob Martinsen received a top honor from the nation’s largest language teaching organization. From left to right: Rob Martinsen, Wendy Baker-Smemoe, Jennifer Bown, Dan Dewey. PROVO, Utah (Jan. 25, 2016)—Can utterance fluency in a second language predict overall second language proficiency? Professors Wendy Baker-Smemoe (L.E.L. ), Dan Dewey (Linguistics and T.E.S.O.L. ), Jennifer Bown (Russian) and Rob Martinsen (Spanish) have discovered evidence from five different languages that suggests this might be the case. The article produced by their research, “Does Measuring L2 Utterance Fluency Equal Measuring Overall L2 Proficiency? Evidence from Five Languages,” was given the Pimsleur Award by the American Council of the Teaching of Foreign Languages (A.C.T.F.L.) this past October, an award that recognizes the best research article published within any given year. The article was the first study of its kind to examine multiple languages across various measures of utterance fluency; something that Baker-Smemoe believes distinguished their article from other publications last year. The group’s research on the subject of utterance fluency and second language proficiency measured Oral Proficiency Interview (O.P.I.) test results from five different languages – French, German, Japanese, Arabic and Russian – to determine whether or not an individual’s speech rate (i.e., how quickly they speak) in a second language corresponded with the measured proficiency and speech rate of a speaker of another second language. Though they found that not all measures of fluency were related, the biggest one – speech rate – did in fact indicate proficiency across all of the languages studied. Baker-Smemoe explained that it is difficult to make comparisons across studies because each study uses different methodologies. For example, if one study reveals something about French, it does not necessarily mean that it transfers to German or Russian. The research conducted for this study also revealed whether or not O.P.I. test results were biased based on the perceived difficulty of a language. “Theoretically, if the O.P.I. indicates you are Superior, then you should be Superior, but we didn’t know if people were kinder to people who were speaking Japanese because they knew it was harder, or if they were using the same kinds of measurements because they were using a different language,” Baker-Smemoe explained. The study revealed that individual language speakers had a similar speech rate or number of pauses no matter what language they were speaking. In other words, their proficiency measurements were the same across all languages. “We did find differences across languages, but overall we found they were really similar,” Baker-Smemoe said. Sylvia covers the Department of Linguistics and English Language for the College of Humanities. She is a junior pursuing a double major in English and French with a minor in women’s studies.